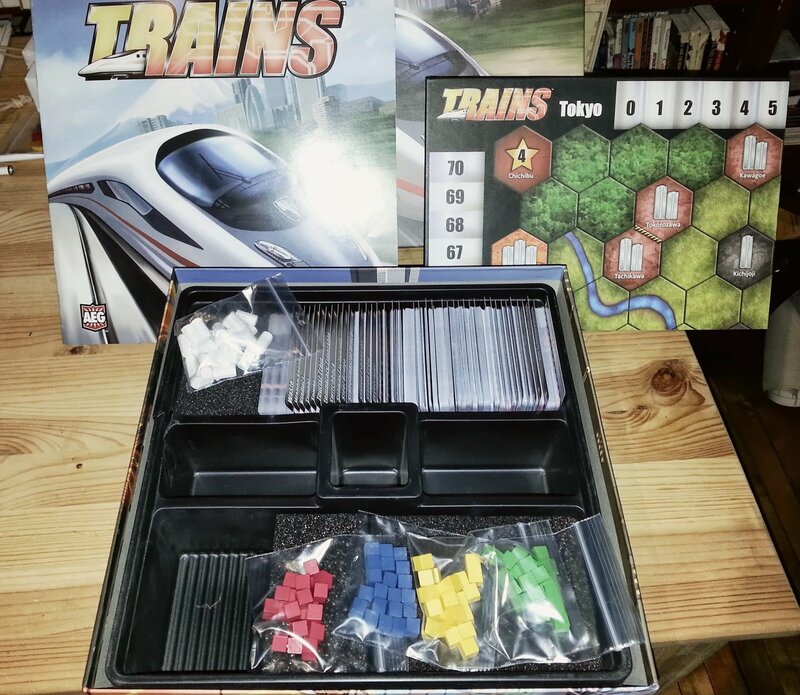 Trains: deck building comes to train games. What’s more, there’s a board in there! 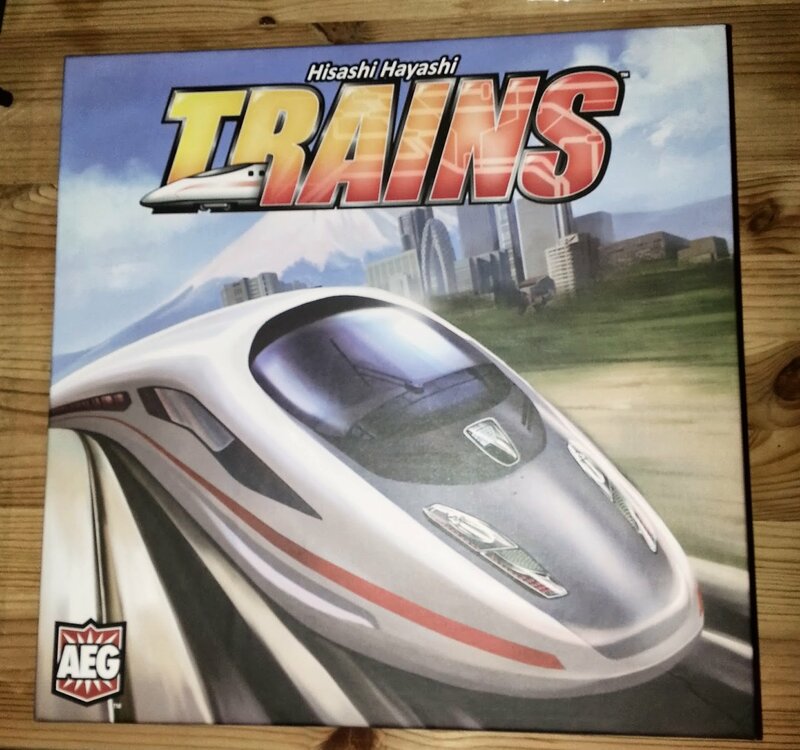 The first of the 5 games, and perhaps the one I was the most eager to get my hands on is Trains (Alderac Entertainment Group), by Hisashi Hayashi. 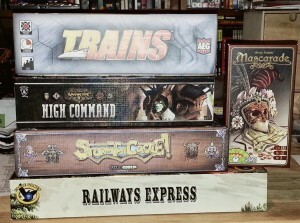 I am a huge train gamer (although I am not really a fan of real trains per se, odd as it may seem), with some 20 18XX title, too many Steam/Age of Steam maps (I own both version of the game, along with Railroad Tycoon) a batch of Winsome games and a sundry more train games (but not Ticket to Ride, go figure). Why? because to me, trains can carry a range of different games, not only thematically, but also a range of skill level. At its most basic, train games are either about: laying tracks, delivering goods or playing with an economic engine. Three very different mechanics that can lead to hundreds of variations. The box content: 500 cards, pieces for 4 players, station markers, a double-sided map and a rule book. 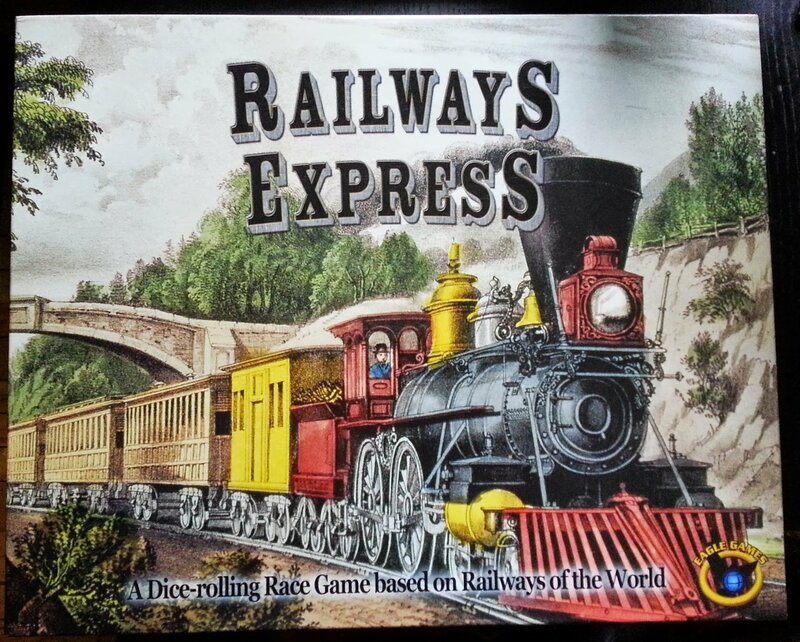 So when I heard last year that a Japanese designer had brought to Essen a deck-building train game, I was very curious and a little excited. When the firs few reports came out and said that it was very good, I was actually a little depressed. What were the odd that I would be able to get my hands, or at very least try this little piece of crazy mashup? 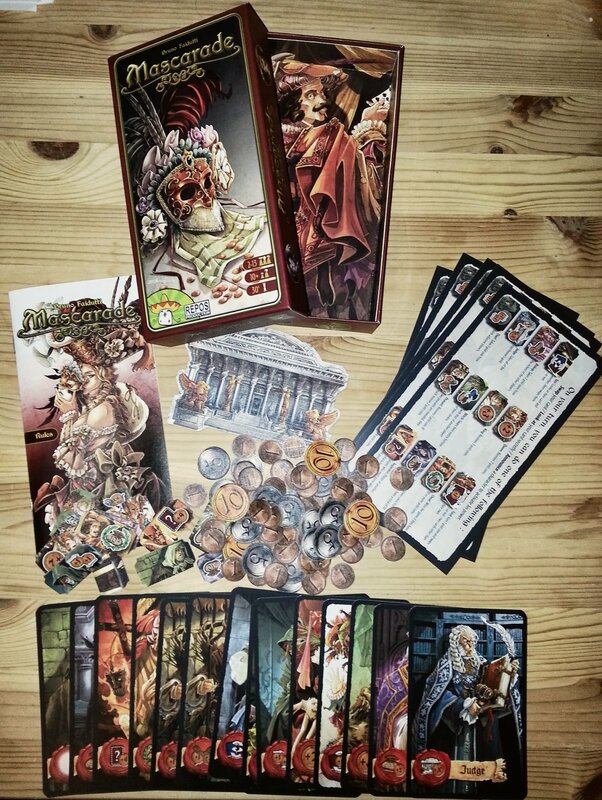 Well, turns out that there is a Santa Claus, or at least a boardgame company that’s very interested in what is going on in Japan: Alderac Entertainment Group. They’ve had great success with Love Letter, a master class in minimalist game design and since then, they’ve brought other, great Japanese games. What is Trains about? It is a deck building game where you use the cards to place tracks and stations on the map. Now, there is no real economic engine (although there are certain cards that will give you victory points every time you play them) or delivery mechanic, but you still get to build the best network possible. It looks simple to teach, but also like it can be a lot of fun and seems to have lots of replay value since you’ll be using only 8 of the 30 different available cards in a given game. They’ve already released an additional map and I wouldn’t be surprised if expansions were released, both cards and maps, for this. Can’t wait to try it. From big box to little box: the second game in the stack is Mascarade (Asmodee) by Bruno Faidutti. I have a spotty history with Faidutti, with some games that I loved and some other that I really dislike (I’m looking at you, Valley of the Mammoths). One of the games I really like from him is Citadel, which is a master class in a simple game that carries a lot of gameplay simply by having secret roles. 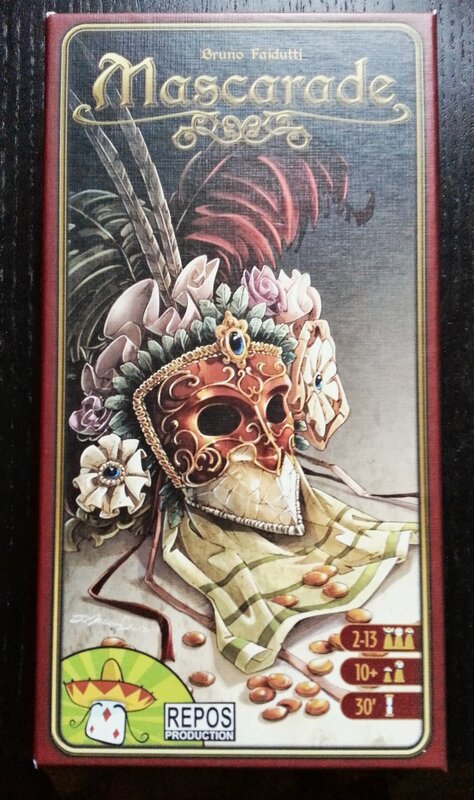 Well, Mascarade (or Masquerade) is a little like that. It’s almost as if Citadel went on a diet and at the same time stretched itself. All this can feed a family of 14, gamers that is. What attracted me? Well, I like Citadel, but I may have overdone it a while ago and as a result, it hasn’t hit the table in a long while. Mascarade has a similar feel: each of the 14 characters has a special power and although the players do not choose their character, they will still switch and use their power. At its heart, it is a game of bluffing and seeing how far you can push things. It is also a game of memory. The rules are super simple and I simply don’t have enough simple games that can accommodate a large group. 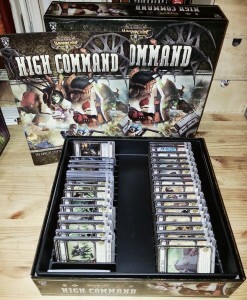 And another deck builder, this time Warmachine: High Command (Privateer Press) by someone who isn’t listed, which always makes me feel bad. Designed by committee or by a freelancer? My main reason for buying this game was that, apart from the spectacular Puzzle Strike, I don’t really have any deck builders that are confrontational. 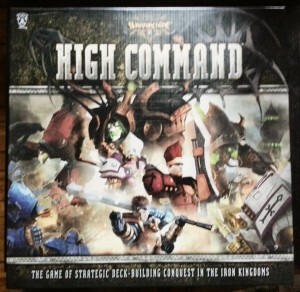 I am also curious about the Warmachine universe and I like the idea that they’ve released two boxes (the other being Hordes: High Command) that can be played independently or combined (shades again of Puzzle Strike and Puzzle Strike Shadows). Bare bone or pared down? You be the judge! The contents of the box are pretty basic: 390 cards (broken down into 4 group of faction cards, a set of terrain and a set of events) and a rulebook. The box might seem very big at first, but the insert leaves room for the unavoidable expansions. The cards are a little flimsier than I would like, especially since they are the only game piece and, if I go from experience with deck builders, you’ll probably need to shuffle your deck many many times. Intrigued, but a little wary. What’s that? Another train game? Yup. 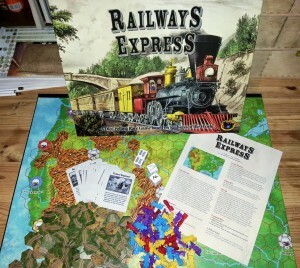 This time, Railways Express (Eagle Games) by Sean Brown, Carey Grayson and Rick Soued. 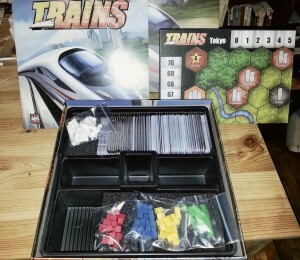 I did mention how I love me some train games, right? Trains! Tracks! Cubes! Cards? Dice? What’s the catch this time? Simple: cards and dice. I have to admit that I don’t know a lot about this game, but the fact that it’s supposed to be a descendant of Railroad Tycoon, which is a simplified version of Age of Steam, was enough to get my attention. Add some cards and use dice with faces for terrains or tracks and you’ve got all my attention. Very, very curious to see how this one plays. 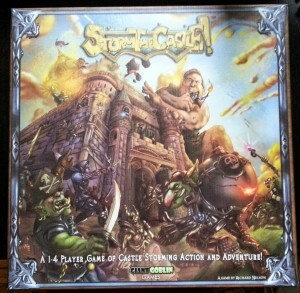 Last but not least, my Kickstarter reward for backing Storm the Castle! (Giant Goblin Games) by Rich Nelson. Fun looking game of playing one of the evil fantasy races (the Green Tide, the Undead Horde, the Dark Elves and the Arcanists) who are trying to crack open a castle that’s being defended by the good guys. I sometimes miss playing Warhammer or Warhammer 40k sometimes. I used to play a lot when I was in college (had 2 armies in both games) all them years ago, but I haven’t painted a miniature since then and the cost is prohibitive. What attracted me to Storm the Castle! 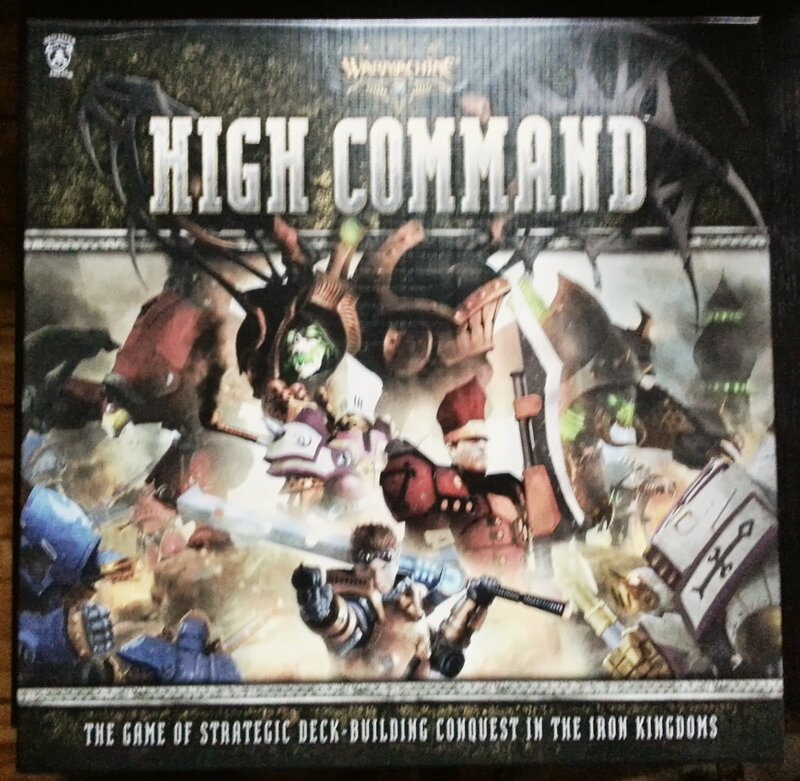 is the idea that I can play something that will (hopefully) feel like a good miniatures game, but without the cost. And beside, what’s more fun than assaulting a well defended position? Especially when the system plays the boring part, the defender? and that you have to be the first one in to win? Lots of cards, lots of counters, a few dice and a nice map of the castle. Oh, and lots of extra goodies for backing the project, which is always a win win to me. Looks really interesting and I am looking forward to giving it a spin. Well, I’ve reached the bottom of the pile. Have fun gaming, I know I will!